A tale of misperceptions and revelations, Shakespeare’s The Winter’s Tale explores how the smallest jealousies, true or false, can change the course of lives and kingdoms, how fate can exploit and forgive us, and how our actions unfold far into the future. 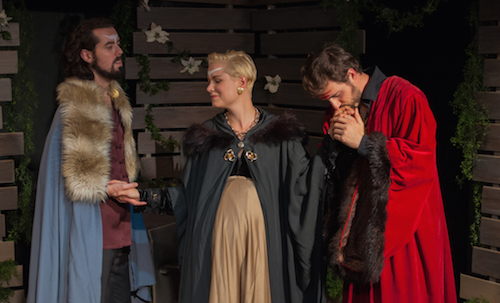 Leroy Street Theatre’s production of The Winter’s Tale at Unit 102 lives up to it’s mighty themes, creating a beautifully raw depiction of the tale. With Shakespeare productions, I find the biggest asset or downfall is how clearly the actors can speak and put together the language to make it understandable for the audience. Leroy Street Theatre’s production excelled in this regard. I was able to firmly grasp what the characters were saying and doing throughout the production. They used the language to the fullest, squeezing out every drop of meaning and delivering it with clarity, intelligence and passion. The set flourished in its simplicity, like the production itself, and consisted only of wooden planking and various white flowers. It was greatly enhanced by the clever lighting design, by Steve Vargo, which convincingly transformed the simple space into roaring thunderstorms and telling silhouettes. Though many of the cast members gave strong performances, the stand out of the evening, hands down, went to Sarah Naomi Campbell as Paulina. As soon as she walked on the stage, my eyes were drawn to her. Campbell played Pauline with unbounded strength, and her fiery defence of the truth was as compelling and convincing as it was heart wrenching. Other standouts include Anne von Leeuwen as Hermione, a queen holding onto the last of her grace even as it is stripped away from her, and Leontes, the jealous and destructive king. Lauren Horejda’s direction had wonderfully surprising moments, and was a thrilling Toronto directorial debut. With moments ranging from Hermione’s shattering speech in defense of her life and honour, to the joyous dances of the country folk in Sicilia, she deftly handled the range of playing space in the show and managed to hit on the humanity in all of it. Though she occasionally had too many characters floating distractingly around the side of the stage, for the most part everything seemed purposeful to the plot. Leroy Street’s production is not the ornate, castled and turreted Shakespeare that is so often what we come to expect. Instead of expensive sets and costumes, this production focuses on the characters and their words, and it’s refreshing to see it done this way, especially with so much success. It’s a fantastic opening to Leroy Street Theatre’s season, and I can’t wait to see what else they have in store for us. Tickets can be purchased through the Leroy Street website, here.